Ad 2) Both ring fingers display a 'whorl'. I have marked both triradii, and I have connected them with a straight red line. Because the (green) ridges lines between the 2 triradii CROSS the red line this is a 'whorl'. (NOTICE: Only if all ridges lines between the 2 triradii had not crossed the red line, then it would have been a 'peacock'). >> So, yes, I can confirm all 3 fingerprint observations you've made! Ad 3) Sorry, I don't fully understand your question about 'life purpose', but I think you're right... any 'life purpose analysis' should include the fingerprints + other hand characteristics. I hope you like my answers!? jj, I agree with Martijn about the determination of what fingerprints you have. 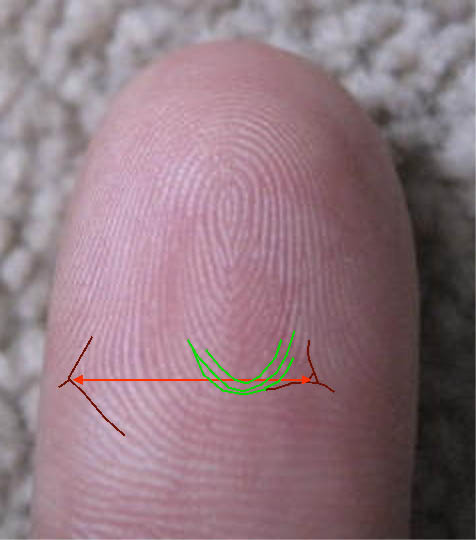 To answer your question in more depth, the palm lines, finger sections, length and width of the fingers and the shape of the palm all are part of a full hand analysis reading. Almost everybody's hands has opposite markings - at least they seem like opposites. I see it regularly. When I'm doing a one-on-one reading, I look for the overall pattern - on both what is going well and what is challenging to work with. And there is always a pattern. Lets have a look at putting together a few of your hand features. You said you have earth shape hands. Actually I wasn't sure if they are earth or fire (palm looked rectangular, but not easy to tell on screen.) However the base of your hand is very well developed which adds earthy characteristics, so even if it was fire it's also very earthy! This handshape is good for any kind of physical outlet. You like a 'hands-on' approach to things. Your short fingers means you can see the bigger picture and prefer not too much detail or theory, just to be getting on with things in a practical manner. Pamelah wrote: jj, one thing about the Apollo/ring finger marked as Life Purpose - it is about creative expression and certainly there will be emotional depression or difficulties if you are not in some way doing something that requires creativity. But let me expand on what is creativity - it could be creative problem solving, the way you prepare food, new recipes, moving around artwork in your home, how you work with a garden if you have one - how you dress. It doesn't have to be drawing or painting or sculpting. Even dancing or singing Karaoke fulfills this partially. Look where you are and examine how you ARE doing some things that require some creative expression. I find this issue common with people who have these fingers marked as Life Purpose. Give yourself credit for anything that has some creativity involved so you have a place to begin. Please appreciate my imperfection as far as my knowledge of the English language. Your loop is a radiale loop and comes from the middle of the palm cross over the mount of Moon. The name is ''Loop of natural expression'' and mean you have an inborn talent to express yourself on a natural way. That can be with your body, like dance, music or mimic art. Or you use natural materials like wood, woll, stone or clay. You have also feeling for original and authenticity. The three of us, all coming from different angles, have some similar ideas on ways that might suit you to express these fundamental hand features of hand shape and dermatoglyphics, before even looking at the lines. With regard to your sensitive, 'people' oriented side that we saw on the other thread & in your loops, maybe you can combine this with your 'hands-on creative side'? for example, I also used to work with mentally disturbed people to help them live independently in the community, we did things like cooking & gardening which they really enjoyed. other people used to lead them in activities such as drama, art workshops etc. I hope this gives you some idea how to correlate & combine these hand features, and maybe ways you could express them in your life? PS you also asked (about lines) "if a life purpose is not supported with a good palmar feature the can he/she sucessful in the mention field". I don't see any hand feature being 'good' or 'bad'. Just different ways of expressing or using the fundamental hand features that we have. There are always positive ways of applying our skills, talents, inner needs etc. So, yes I think people can be successful in feeling more fulfilled in life, by using whatever combination of hand features they have.